Robot Nails by Charles Aweida is an exploration in new media art centered around the concept of creating tangible artifacts from intangible forces. 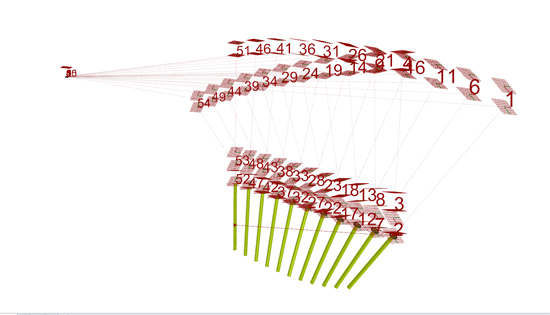 In this case a data visualization generated by the motions of wind. The creation of this project involed several digita tools like Daniel Piker´s Kangaroo physics engine to simulate the effects of wind of a piece of cloth. The resulting cloth in movement later gets froze int a triangulated surface where information was extracted and transferred as a vector field forming an abstract representation of wind. 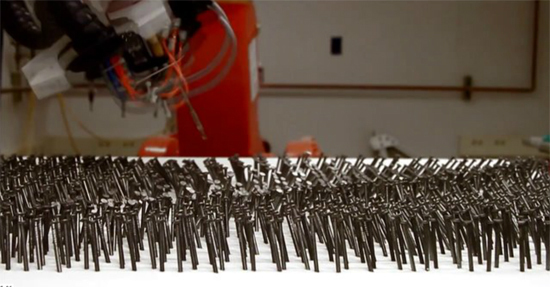 Then the resulting vector field was used later to create a series of planes which were used to produce a conflict free path sequence for a robot.The robot instructions are centered around a sequence for the 6 axis arm to pick 6 inch nails from a dispenser and place them one by one into a piece of high density foam at their corresponding angles. an exploration in art + robotics, representing wind through digital fabrication and the tangible from charles aweida on Vimeo.